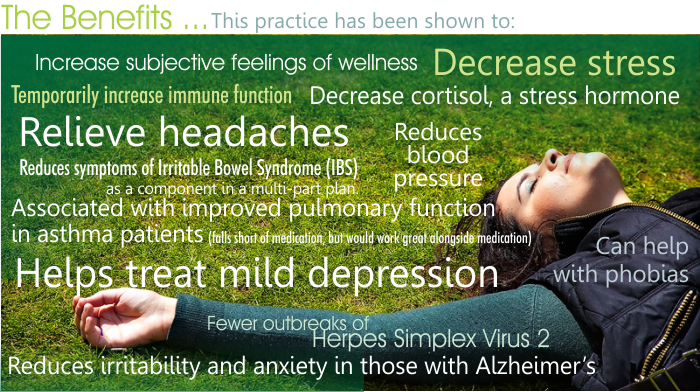 Progressive Muscle Relaxation: Work Out the Kinks Fast! 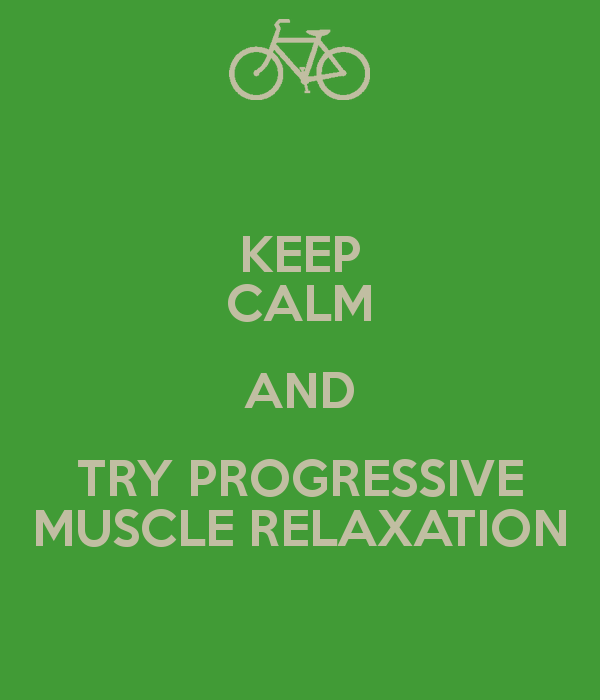 Progressive muscle relaxation can be done in a sitting position or lying down. Close your eyes, if you like. This is one of my go-to relaxation techniques since it can be done anywhere I go! 1. Start at your feet. Become aware of your feet as they rest on the floor. Notice the sensations you may feel in your feet. Are your feet heavy or light? Hot or cold? Stiff or in pain? Allow your feet to simply relax and feel heavy on the floor, or "grounded." 2. Work up to your ankles and let them relax. Focus now on your calf muscles and notice if there is any tightness or tension. Let go of the tension in your calf muscles. 3. Bring your attention to your knees. Let your knees relax. Make sure they are not buckled. Let go of all the tension in your knees. 4. Work your way up to your thighs. Relax the large muscles in the front part of your thighs. Now relax the back part of your thighs. Feel the weight of your thighs as they rest against the chair (or bed, mat, etc.) Let your thighs relax completely. 5. Bring your attention up to your hips and buttocks. Feel their weight as they rest against your chair. Allow your body to relax more and more completely. Let go of any tension you may feel in the hips and buttocks. 6. Now focus on the front of your body in the abdominal area. Allow your belly to relax and to move gently as you breathe. Notice any tension or tightness in this area and let it go as you focus on the gentle movement of your belly with your breath. Visualize this portion of your body as a tube that gently fills up with air as you breathe in and gently releases the air as you breathe out. 7. Concentrate on the front of your body as you work upward. Notice the diaphragm area, the stomach area, and the chest area. Focus your attention on your chest and visualize your heart. Focus on relaxing the heart. Feel the steady beating of your heart as you become more and more completely relaxed. 8. Bring your attention to your lower back. Feel the natural curve in your spine. Notice any stiffness or pain in your lower back. Let go of all the tension. Let the spine relax and work your way up your back. Bring awareness to the different areas of your back. Pay attention to any areas that feel tight. Let go of the tightness in your entire back. 9. Now focus on your shoulders. Let your shoulders relax and sink downward. (If you are sitting in a chair, notice your shoulders sink toward the floor. If you are lying down, notice your shoulders sinking toward the mat or bed.) Notice if there is any tension in your shoulders. Visualize the tension leaving your shoulders. Feel any tension or pain drain away as you relax more and more completely. Allow the back of your neck to relax along with your shoulders. Visualize your neck and shoulder area becoming softer, looser, and much more relaxed. 10. Concentrate on your arms. Let your arms rest on your lap, if you are seated, or lie beside you, if you are lying down. Notice how your arms feel. Let your arms relax completely. Feel the tension leaving them. 11. Notice your wrists, hands, and fingers. Feel your hands resting and notice any sensations you might feel. Allow your hands to become slightly open. As your hands open, feel them becoming more relaxed as the tension is released. Feel your arms and hands becoming more and more completely relaxed. 12. Bring your attention to your face and throat. Let your throat relax as you move up to your face. Notice your chin and see if you are clenching your jaws. Let your jaws relax. Allow your cheeks to relax along with your chin and jaws. Let your eyelids, eyebrows, and forehead relax. Let go of any tension in your forehead so that there are no worry lines in it. Feel your forehead becoming smooth and rested. Feel your entire face becoming more and more relaxed. Let all the tiny muscles in your face relax. Allow the area on your forehead between your eyes to feel completely relaxed and smooth. Your face feels no tension. 13. Scan your body from head to toe. Your entire body feels completely relaxed. Notice the weight of your body as you sit or lie down. Your body way feel heavy, as you notice how it feels against the surface, or it may feel light, as you feel the tension leaving. Either feeling is wonderful. Simply focus on feeling relaxed. Attend to your breathing. Allow your breathing to be calm and peaceful as you continue to relax. To add even more awareness to each body part, tighten up your muscles before loosening up. Use progressive muscle relaxation in combination with other relaxation techniques. A. At the end of the progressive muscle relaxation exercise, you may open your eyes and become more alert by stretching out. Raise your arms up slowly above your head, extend your fingers, stretch out the legs, and wiggle the hands and feet a little to prepare for movement. B. At the end of the progressive muscle relaxation exercise, you can simply focus on breathing techniques. Pay attention to what your mind is doing. If it wanders away from your breathing, just focus again on the individual breath. It is okay if your mind chatters away. This is normal. Just keep coming back to your breathing. Let the thoughts go. C. At the end of the progressive muscle relaxation exercise, you may begin a meditation. You can repeat a peaceful word, such as "Love," "Ohm," and "Peace". You can say a prayer or mantra. You may want to visualize a soothing mental image or place that makes you feel good, such as a beach, forest, etc. 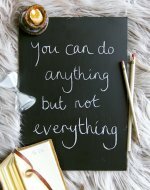 No matter which word or positive image you are holding in your mind, make sure to attend to your breathing. Continue to feel relaxed. D. At the end of the progressive muscle relaxation exercise, allow yourself to fall asleep. Progressive muscle relaxation is a great techniques to use if you are having difficulty falling asleep.